Power Source: The Murphy Legacy Historical Maryland family continues excellence within the field of the law. William H. Murphy Sr., Jr., III. The Murphy Firm. Flanked by his son and firm Managing Partner, William Murphy St. addresses the media. The Murphy family has been influential in our region since the early 19th century. In the 20th century, The Honorable William H. Murphy Sr. was the scion of the family and a legend in Maryland. The family legacy continues with Former Circuit Court Judge William H. Murphy Jr., who is widely respected as one of the most extraordinary attorneys in the nation. 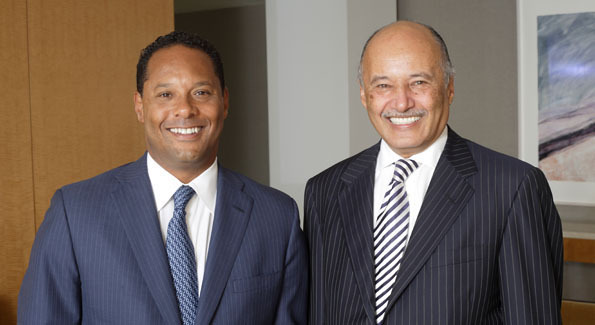 His firm is led by his son, Managing Partner William H. Murphy III. William H. Murphy III & William H. Murphy Jr.
William H Murphy Jr. holds the distinction of having the largest winning percentage in the history of the Maryland Bar. For over 100 years, the Murphys have been among the elite families of Maryland. Murphy’s father, former Maryland District Judge The Honorable William H. Murphy Sr. instilled in his children a regiment of intellectual precision and responsibility to the community that has dominated the family business, political and community activities for over 100 years. Mr. Murphy possess the rare and innate mastery of logic, probabilistic reasoning, psychology and tactical skills required to litigate and win the most nuanced and important cases of our time. Mr. Murphy’s methodical approach to his victories stem from his training as an electrical engineer at the Massachusetts Institute of Technology, in Cambridge, MA prior to attending law school at the University of Maryland School of Law.